SIMFEROPOL, Ukraine -- New Ukrainian President Viktor Yanukovych has dismissed the presidential envoy to the Crimea, the predominantly Russian-speaking Black Sea autonomous republic, as part of his plans to shake up his predecessor Viktor Yushchenko's pro-Western establishment. A presidential order dismissing Leonid Zhunko is published on the Ukrainian president's official website. Zhunko was appointed presidential envoy to the Crimea by Viktor Yushchenko in January 2008. Earlier, he served as chairman of the local administration in the Crimean port of Sevastopol, where the Russian Black Sea Fleet's main base is located. The Autonomous Republic of Crimea has been a source of tension between Russia and Ukraine since the collapse of the Soviet Union in 1991, when the region first claimed independence from Ukraine. A 1994 referendum in the Crimea supported demands for a broader autonomy and closer links with Russia. Tensions rose sharply in 2003 over a bitter border dispute on the Kerch Strait, and again in 2008, over the deployment of Russia's Black Sea Fleet during a five-day war with Georgia. Russia's lease on the Black Sea Fleet's base of Sevastopol is due to expire in 2017, but the new president may look to step back from Yushchenko's strict insistence that the foreign forces leave. 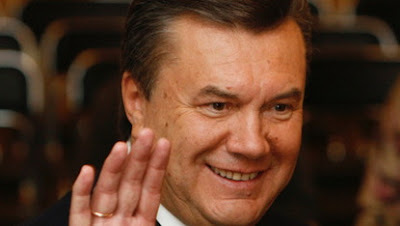 Yanukovych came to power in February after narrowly winning presidential runoff. The new Ukrainian leader has pledged to hold more balanced relations with Russia than Yushchenko, whose West-leaning policies, including a bid for NATO membership, frequently infuriated Moscow. On Thursday, Yanukovych also appointed new governors to 14 out of 24 Ukraine's regions to replace those whom he dismissed earlier. The former deputy head of Ukraine's Security Service, Anatoly Prisyazhnyuk, was appointed head of the Kiev administration.